The Argos pan-tilt head is designed to mount on the TalrikIITM, TJ, TJ Pro, and Robobug robots. It provides mount for additional sensors as well as mounting space for almost anything you could want to put on your robot. There are several prepackaged configurations available for this kit or you can outfit it as you see fit. Click here for more information on this great new product. This NEW sonar transducer can be easily added to any MekatronixTM robot to provide accurate ranging data and object detection. It can also be used independently for many sensing applications. The MekatronixTM Pan-Tilt Head is designed to mount this sonar, making it possible to add a scanning sonar for any sensing application. The MekArm™ manipulator constitutes a two degree-of-freedom (2-DOF) planar robotic arm with an actuated, parallel-finger gripper, all driven by servomotors under control of a robot. The three, independent, servo-driven motions, starting at the base, are called the shoulder joint, wrist joint and the fingers. 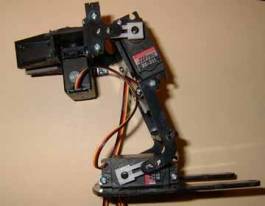 The green lines projecting out of the shoulder and wrist servos designate the axis of rotation for the joints. MekArm™ mounts on the TJ Pro™ robot to provide a 4-DOF manipulator with gripper, a total of five degrees of motion. The wheels of the robot provide two degrees of freedom in the plane of motion of the robot. The plane of motion of the forearm and end-effector is perpendicular to the floor and the gripper fingers move parallel with respect to each other.